Two key themes are dominating conversations about infrastructure technology these days: transformation and disruption (with ancillary discussions about public vs. private cloud thrown in, as well). But what does all that mean to you? How can you take advantage of the latest technologies like containers or maximize new methodologies like DevOps? Which type of cloud is right for you? And what does storage have to do with any of that? More importantly, are you a modern architect who cares more about things like accelerating application development than about the subtle nuances of storage? The new SolidFire.com has knowledge you need, complete with tutorials, demos, and videos that will help you solve real, pressing challenges in your transformation to a next generation data center. Turn here for knowledge about how new solutions and technologies like DevOps, Cloud, Docker, OpenStack, XaaS, etc. can enable greater agility for the digital enterprise or monetize storage like never before for service providers. For instance, Docker has become practically synonymous with containerized environments, but is it really? Other solutions continue to gain momentum. How can you take advantage of tools like Kubernetes, Mesosphere, and OpenStack? Find out in the article: More than just Docker: Where container ecosystem tools like Kubernetes, Mesosphere and OpenStack fit. Or do you want a perspective on how to simplify the process of moving / adding / changing VMs while avoiding the headaches of provisioning, scaling, and operations that could interfere with SLAs? A solution that you can set once and then practically forget is even there? Read the article Zero-Touch Storage: The Future of VMware Software-Defined Storage. Those two articles are truly just the beginning. 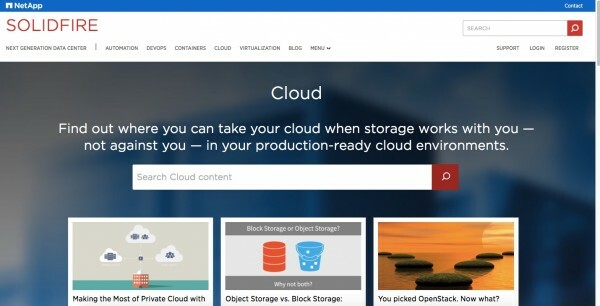 SolidFire.com will feature continually updated content from our team of experts about all the latest next generation data center topics, solutions, and technologies. This isn’t your ordinary storage product website. Because SolidFire has never been an ordinary storage product. Our approach has always been to lead the industry with unrivaled insights about what storage can do. Now, as a core product within the NetApp portfolio, we are continuing to elevate the conversation about the possibilities of the next generation data center. So we’re transforming, too — turning our website into a knowledge hub for articles, tutorials, and other learnings that today’s next generation infrastructure architects aren’t finding from other storage web sites. Register today to gain access to all that SolidFire.com has to offer. With a single sign-on, you can freely browse all available content and get unique perspectives on your transformation into a disruptive force of data center innovation.